Leader of Indigenous People of Biafra, IPOB, Mr. Nnamdi Kanu, yesterday, tackled the Acting President, Prof. Yemi Osinbajo, for declaring the Biafran agitation unconstitutional. 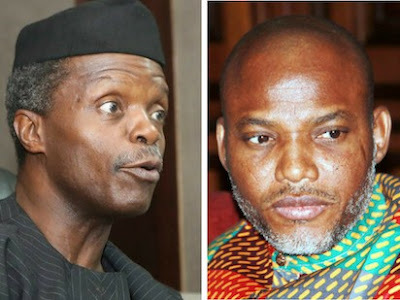 Kanu, in a world press conference he held through his team of lawyers in Abuja, maintained that Osinbajo’s view about Biafra was “patently misconceived and inherently faulty,” despite his rank as a Senior Advocate of Nigeria. In a statement by his lawyer, Mr. Ifeanyi Ejiofor, Kanu insisted that “extra judicial remarks” Osinbajo made before the Igbo Council of Traditional Rulers, in reference to Biafran agitation, was offensive to section 2 of the 1999 Constitution, as amended. The statement read in part: “We are presently drifting into the narrative that had hitherto kept our client in unlawful incarceration for 18 months, in clear breach of positive orders of court that directed for his unconditional release. Unhealthy interference by the executive arm in the matter before the court, vide pronouncements capable of putting fears in the court is a case in point. “This is evident in the recent extra judicial remarks by the Acting President, clearly contained in his presentation before the Igbo Council of Traditional Rulers, that the agitation for Biafra is unconstitutional as it offends section 2 of the 1999 Constitution of the Federal Republic of Nigeria, as amended, 2011, and consequent threat of arrest and imprisonment of those that exercise their unquestionable and inalienable rights to self determination. “This declaration is respectfully considered as not only provocative and unacceptable, but a clear case of undue interference with judicial process, which have the capacity of distorting the mindset of the judicial officer in charge of client’s case. “It is important to remind the Acting President that our client’s present political trial originated from his legitimate exercise of his constitutionally guaranteed rights to self determination as clearly provided for under extant laws, and international instruments/covenants. “It is, therefore, reasonably expected that any of such extra judicial remarks should not emanate from the revered office of the Acting President. “With due reverence to the Acting President, and his rank as a Senior Advocate of Nigeria, we deem it obligatory to state the correct position of the law as it relates to his faulty position. “We observed most respectfully that the learned silk made this remark in direct response to quit notice threats and ultimatum handed down to Igbo living in the northern part of the country, by a faceless and uninformed group, going by the name of Arewa Youths Consultative Forum. “But it must be noted very humbly that it is a mistake to equate the lawful and legitimate aspirations and agitations for Biafra with the unlawful, illegal and illegitimate quit notice, and threat given to the Igbo to leave the North by this group. Besides, Ejiofor, who briefed newsmen alongside counsel to Kanu’s co-defendants, Chidiebere Onwudiwe, Benjamin Madubugwu, David Nwawuisi and Bright Chimezie, accused the Federal Government of deliberately frustrating full-blown hearing on the treasonable felony charge against the defendants. Consequently, Kanu and his co-defendants, demanded an immediate withdrawal of the amended five-count charge against them, saying they have not committed any offence that is known to law. Also, yesterday, IPOB and its leadership worldwide have berated Governor Dave Umahi of Ebonyi State for allegedly unleashing his henchmen to invade Abakaliki Central Market to attack the traders there for the rousing welcome they accorded Kanu, when he visited the state. IPOB in a statement by its Media and Publicity Secretary, Comrade Emma Powerful, said: “The governor exhibited the highest level of rascality by instructing his henchmen and miscreants to attack the innocent traders who turned out en masse to welcome their leader in Abakaliki, the Ebonyi State capital. IPOB also noted that Ebonyi is not the first state to grant Kanu a rapturous welcome and neither will it be the last, and, therefore, warned that such infantile and envious clampdown on traders and IPOB officers in Ebonyi State will hasten Umahi’s return into political oblivion. “We also want to tell him that should he wish to continue serving his Northern political masters, he should relocate to Sokoto because Ebonyi State is one of the strongest states in Biafran land, where the citizens are seriously determined to restore Biafra and Governor David Umahi cannot quench the desire of Ebonyi people in this regard, rather Ebonyi people are ready to dump him because of attacks against IPOB and its leadership. “That attack directed by Governor Umahi was wholly barbaric and uncivilized behavior, coming from an elected public officer of his caliber, it is indicative of the moral decay at the heart and height of governance in Nigeria especially, Ebonyi State that has not witnessed any meaningful development, since the inception of this administration that is only interested in protecting the Fulani herdsmen that has been attacking his state. “That the Governor sought to belittle his office by ordering the unwarranted and unprovoked attack on innocent traders, purely demonstrate his slavish loyalty to his Hausa Fulani masters, and confirms the widely held view that South East Governors, more than Governors of other geo-political zone, are political quislings at the beck and call of the Arewa North. “They have no mind of their own and therefore, are ready and will do anything to please their Northern masters, even if it means killing their own people, what a shame of governance in this part of the world.